Spinzilla is a fun and exciting online casino with lively blue Minion-style characters as mascots. This casino is actually a brand new version of Winneroo Games and markets itself as ‘the hottest destination for mobile and online slot machines’. If you like having lots of games to choose from, Spinzilla definitely won’t disappoint. In fact, there are over 250 games to keep players entertained. There are three main types of games offered by the casino: slots, scratch cards and casino games, with plenty of choice in each category. The casino focuses on slots, with over 230 available, and some of them have progressive jackpots. Adventures in Orbit, Beez Kneez, Cleopatra, Fluffy Favourites, Kitty Glitter, Lancelot, Neon Staxx, Sushi Cat and Wolf Run are just some of the many different slots you’ll find at Spinzilla. As for scratch cards, there are a dozen of them, with titles including Mega Love, Hollywood Stars, Dragon Scroll and Ocean Fortune. Rounding of Spinzilla’s games line-up is a collection of 18 casino games. There aren’t any live games, but players can still gets lots of enjoyment from playing games such as Baccarat Professional Series, French Roulette, Deal or No Deal, Deuces Wild and Texas Hold ‘Em, to name a few. To make finding the right game for you a bit easier, there are various filters you can use to whittle down the huge collection of games. As well as filtering the games by slots, scratch cards and casino games, there are filters for progressive jackpots, the most popular games and games by NetEnt; you can also sort the games by theme. Spinzilla has a loyalty points scheme where for every £2 wagered on the casino’s slots, scratch cards and casino games, you’ll earn one loyalty point. Once you’ve earned 1000 loyalty points, you can start redeeming them for bonus cash at the rate of £1 for every 1000 points. 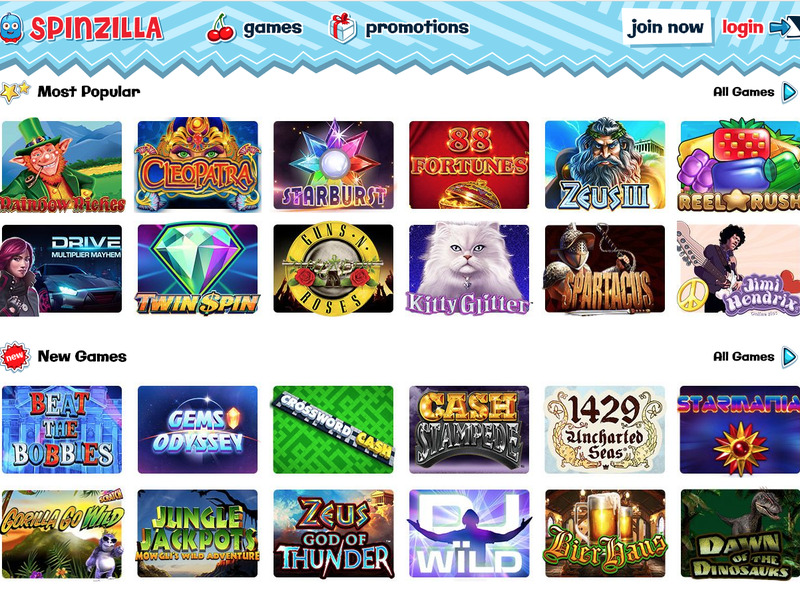 Spinzilla doesn’t appear to have any sort of VIP club so it seems that the loyalty points are just for players to earn and redeem for bonus money; other casinos have VIP schemes where the more loyalty points you earn, the higher your level and the more rewards and bonuses you’ll get to enjoy. Spinzilla can be accessed and enjoyed in full without you having to download any additional software to your device. This online casino is operated in the UK by 888 UK Limited, a company that’s based in Gibraltar and has a licence from the UK Gambling Commission. Customer support is available round-the-clock, with an email address, toll-free UK number and contact form supplied on the website. The casino accepts a variety of payment methods and promises fast cash out rates, with a return to player rate of 95%.